The green-apple colors of this gem refresh and invigorate the senses. Peridot is treasured by the Hawaiian peoples who believed the gem to be the tears of the Goddess Pele. Romans called the gem “Evening Emerald” because its brilliant color did not fade in lamp light but instead took on a lively glow. Much of the Peridot available on the market today is mined by Native Americans on Arizona’s San Carlos Reservation and is called Arizona Peridot. It is a more delicate stone and is rated “fair” for everyday wear. 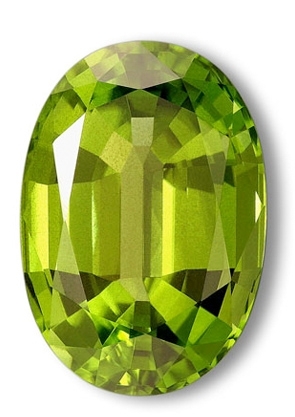 Peridot is also August’s birthstone.